Band box, paper collar soldiers; literally. 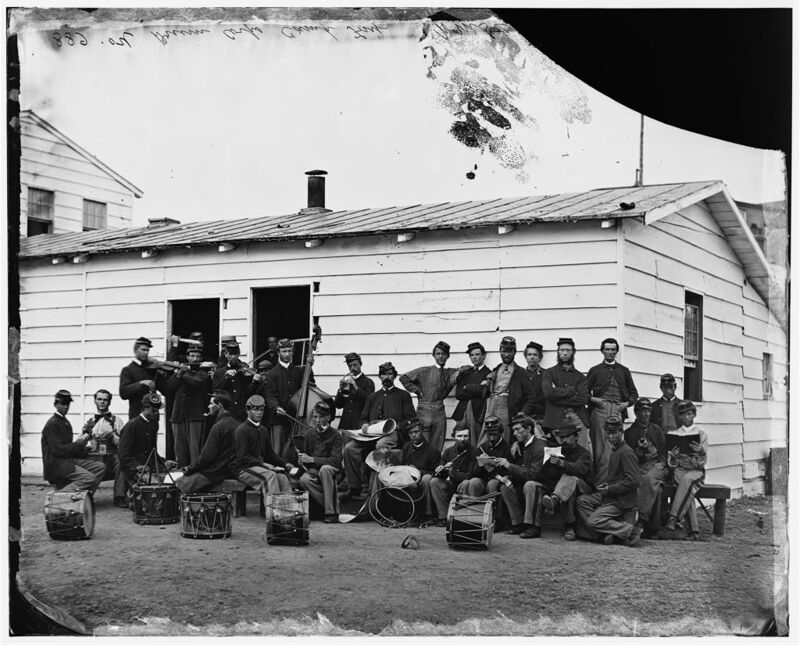 Pictured here are the 10th Veteran Reserve Corp’s Drum Corp in Washington, DC June 1865. The Veteran Reserve Corps used to be designated the Invalid Corps, made up of convalescing soldiers who were too disabled for active service but not so severely that they were discharged. Wikipedia article on the Veteran Reserve Corps. What I find interesting is the presence of the orchestra instruments in this image and it is a little hard to see a drum corps with a string section, but there is also a level of goofing around in some of these images that these musicians also see the humor in grabbing another instrument to “play”. It is also very possible that this group is actually several sub groups together who play a variety of instruments. An army band is full of individuals who play multiple instruments. I spent 15 years in the 44th Army Band in the New Mexico National Guard and we played multiple roles depending on our talents and sub groups that might be formed for a variety of venues. It is also likely that these men with the stringed instruments only play those instruments and were utilized for small ensemble occasions along with a ceremonial role. The style of dress is unique to military bands. The base uniform was probably the sky blue Kersey trousers with stripe (no NCOs are evident in this from those still wearing their sack coats.) This is not unusual as the civil war uniform in the regular army was a frock coat of dark blue and dark blue trousers for dress parade and sack coat for fatigue detail. All volunteer organizations were issued the basic fatigue blouse (sack coat) and sky blue trousers as the base uniform for regular and fatigue duty and the frock and dress trousers for official functions. Army bands today spend most of their time in dress greens and an almost equal amount of time in dress blues as the role is ceremonial for most of the duty. The other item that is in preponderance is the kepi and most seem to be trimmed in gold much like what is commonly seen of higher officer’s choice of dress. The infantry bugle can be seen adorning the top part of some of the kepi’s and only one man has a forage cap on. Uniformity, even with this unit, seems to have been something of a latter day marshall insistence by the military of today, even in the same regiment a variety of dress and styles can be seen in any image. Some of this was due to differences in what the Quarter Master drew for uniforms and equipment and what the men may have been able to purchase for themselves. The crisp uniformity of dress became more of a staple with the rise of the larger and larger permanent army. The regular army during the civil war was still relatively small, volunteers making up the majority of those who served and this would explain a lot of why we fail to see the uniformity we often expect from our military today. The last thing I wish to point out are the paper collars evidenced here. The 19th century shirt was dual purpose. It was long (down to the knees) had a short button down front (down to the naval) and did not have a collar (at least not a traditional collar but a short, high collar). The paper collar was donned for ceremonial purposes and parade, even as late as the Petersburg Campaign as highlighted by diary entries and letters by men of the 57th Mass. Volunteers in Mother May you Never see the Sights I’ve Seen by Warren Wilkinson. There was an insult in the war that soldiers used to describe other regiments or those who only saw garrison duty. Band box or paper collar soldiers as explained by Billings in “Hardtack and Coffee“. Band Box referred to gentleman such as these whose duty in the war was strictly ceremonial and who played in a band box, a small stage or contained area for giving concerts or playing for parades and official reviews. Some really terrific work on behalf of the owner of this website , absolutely great content . Next Next post: Musics, beat off! Oh, grow up!